Today was just one of those days. I don't feel that I accomplished anything. I do have everything organized for the class I'm teaching later this week, but it isn't packed yet. I still have time. Oh wait, I think I said that yesterday. Okay tomorrow everything will get packed. In my quest to get all the gem tree supplies and kits ready for the class I went to a major fabric store today....yes it is a bit of an obsession and I do go there more than once a week, but I just couldn't help myself. So, while I was waiting on my number to be called to get some interfacing cut, I wandered the store. 30 minutes later and my number wasn't even close to being called but I found myself in the scrapbook area. I love looking for unusual items to use in my jewelry or on my gem trees or in this case you could call it a wire tree sculpture. So to give my students a look at what they can create with something not a gemstone, I used these little metal tags. They were even on sale for .99 a pack so I bought several. It definitely makes a different little tree. A little black wire and some crystals and it has a little bling, just my kind of tree. I've really started thinking about joining in on the monthly ABS (Art Bead Scene) Challenge. 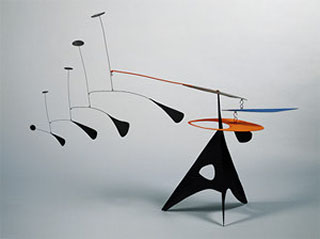 This month the challenge is to create a piece based on a sculpture by Alexander Calder called Blue Feather circa 1948. Humm, do you see a resemblance between the swing arm and my tree branches? I'm thinking some beautiful teardrop briolettes dangling from one side and dark pearls or maybe some black onyx rondells at the top. Now I just have to figure out how to bring in the other elements of the structure into a necklace design. It's very futuristic with hard edges and geometric shapes. Check out the ABS blog for some of the prizes that could be won and rules to joining. I saw this yesterday Dana--but didn't have time to post because of techno glitches and ARGH! I will not get into it! I love the tree--it's cute and funky but artistic. I'm looking forward to see what you will come up with for the ABS Challenge!